Most travelers enjoy calm and leisure on their vacations, finding space in quiet destinations that offer relaxing attractions to soothe nerves and abate aches. Other travelers seek out places with plenty of entertainment and attractions well-suited to families or large, rambunctious groups. Then, there is a small fraction of travelers who look first and foremost for vacations filled with adrenaline, where every activity is white-knuckle and bravery is a must. Believe it or not, Niagara can accommodate all three types of vacations. If you want a vacation that will keep your heart racing and your teeth clenched, book a room in Niagara Falls and prepare your body for these extreme attractions. To start your trip off easy, purchase space on any one of the city’s illustrious helicopter tours. With tours departing regularly, it’s easy to schedule a quick birds-eye view of the area. If the standard family tour isn’t enough to get your blood pumping, look into companies offering adventure tours, where you’ll get access to some of the most remote regions of Niagara. 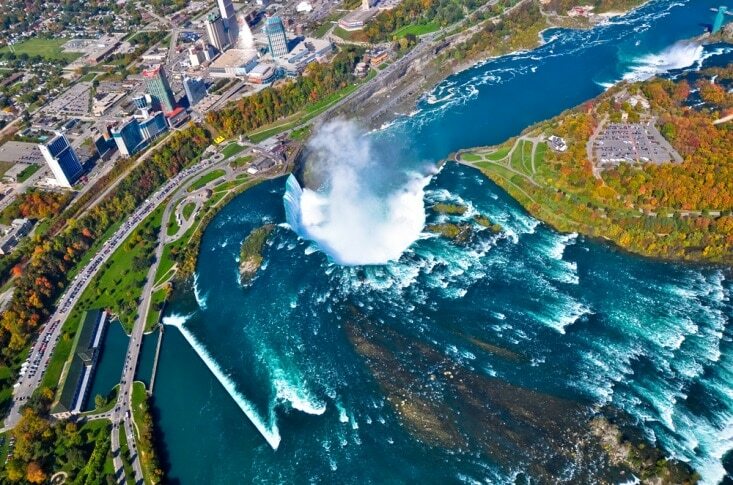 Because Niagara is such a stunning region, it should come as no surprise that people love to see the landscape from all angles, including 15,000 feet in the air. 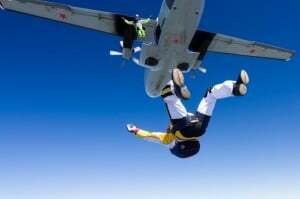 Skydiving is a popular sport in and around Niagara Falls, and thrill seekers over 18 are welcome to jump out of a plane and float toward the verdant forests and patchwork of farmland far below. If this will be your first jump, you’ll learn the ropes with a class beforehand and have the guidance of an instructor throughout your flight, and experienced jumpers are welcome to explore the skies as well. Many companies offer video services to record your experience for posterity. If you don’t feel quite brave enough to tackle the real thing, you can still experience freefalling at Niagara Freefall. Instructors will educate you about skydiving, and then you’ll be let loose in a vertical wind tunnel strong enough to keep anyone floating well above ground. Though you won’t get the scenery, you will get a quickened pulse. If you prefer your thrills a bit wetter, the world-famous Whirlpool Rapids — widely touted as the most dangerous rapids in the world — are available for exploration. The Whirlpool Rapids are generally regarded as too violent to permit human-powered rafting, but that doesn’t mean you are forbidden from experiencing their power firsthand. The Whirlpool Jet Boat Tour will take you directly into the churning, white-tipped water so you can feel the cold spray of the Niagara River. The jet boats are safe and reliable in the chaotic water, which means you can feel secure in one of Niagara’s most perilous places. To see the rapids from the air, schedule time for the Whirlpool Aero Car, which suspends travelers in a car far above the whirlpools and rapids. Hanging above a wild and powerful river on just two cables strung through the air, your adrenaline will kick in as you dangle directly above the rapids. Alternatively, the White Water Walk will take you within walking distance of the whirlpool. The journey can hardly be called strenuous or heart-pounding, but the views from the bridge will amaze you as you peer right into the frenzied water. 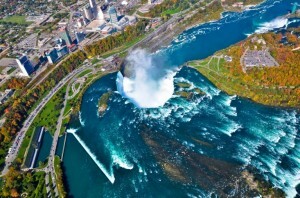 Niagara Falls is an amazing place to test your mettle, whether you desire flying, jumping, or rafting. Plus, the best part of Niagara’s extreme attractions is that after your need for speed, height, and danger has worn off, you’ll still have plenty of serene and entertaining attractions to keep you busy.